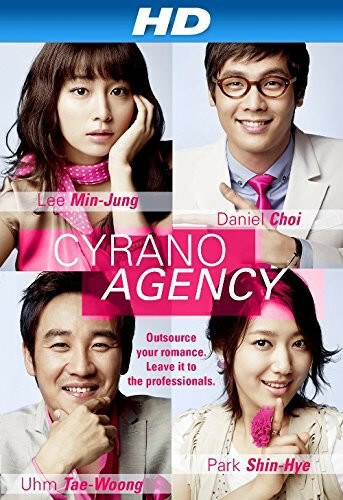 The Cyrano Agency is a dating agency which helps people who can't date to have a love life. The agency staff try helping their clients without being noticed. The agency's representatives Byeong-hoon (played by Eom Tae-woong)and Min-yeong (Park Sin-hye) are giving their best to pair up their client, Sang-yong (Choi Daniel), with his love interest named Hee-joong (Lee Min-jeong). But when Byeong-hun sees Hee-joong's profile, he begins to doubt their abilities. Will "Cyrano Agency" succeed in their mission? This is a fun little romantic comedy made the Korean way. And a special notice for Eom Tae-woong, who i think is a good actor. He resembles another great Asian(Chinese) actor, Tony Leung(starred in In The Mood For Love).